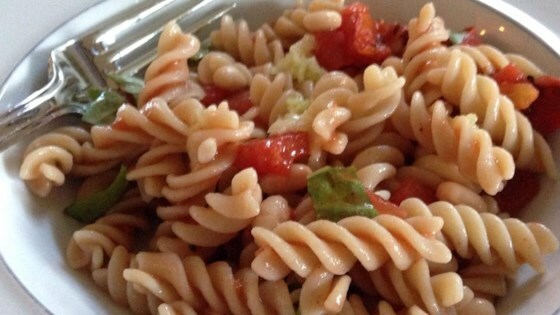 "Pasta is tossed with white beans, roasted tomatoes, fresh basil, and a garlic infused olive oil. Serve with crusty bread to soak up the sauce and any leftover garlic olive oil. This isn't a hot pasta dish so it's perfect for summer." Combine the olive oil and garlic in a small bowl. Set aside. Fill a large pot with lightly salted water and bring to a rolling boil over high heat. Once the water is boiling, stir in the bow tie pasta and return to a boil. Cook the pasta uncovered, stirring occasionally, until the pasta has cooked through, but is still firm to the bite, about 12 minutes. Drain well in a colander set in the sink. Place the pasta, beans, tomatoes, basil, and 2 tablespoons of the garlic olive oil in a large bowl; toss gently until combined. Serve the remaining olive oil at the table to drizzle over individual servings. Very easy and delicious!since we like spicy I added a teaspoon of crused red pepper . This is not very good. Great idea, but needs a lot of help. i did not care for this recipe. it really does need a LOT of help. back to the drawing board! So fresh and light. The perfect snack or even as a main dish. A little too much oil for me, so I just eyeballed it and used a few drizzles. Delicious! Even my husband who is a meat an potato man enjoyed it!